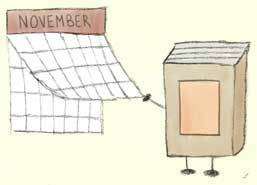 November has been a total blur—it's been crazy busy at work, which has translated into me falling asleep most weeknights while attempting to read. I've been in a bit of a reading/blogging slump lately, too. :/ I'd like to finish out the year strong, though, so I'm going to give reading my all next month, even amidst all the bustle of the holidays! I'll cheer you on, Lee, although I nominate you share your knitting progress here. I do want to see the finished product of that scarf you're working on, the colors looked wonderful! Thanks for the support, sis! :) I'm doing my best to keep up with reading; I really, really want to at least make my Goodreads goal. I'll probably post a pic of the completed knitting project after Christmas.